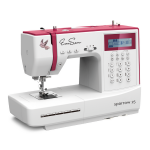 Learn the basic functions of your sewing machine and complete a simple project! This is the perfect skirt for summer and the perfect pattern for beginners. Even if you've never sewn a garment, you can make a really flattering skirt for summer. The Amy Butler Barcelona skirt is a tried and true favorite. You'll learn basic fitting, how to sew a lining into a skirt, inserting a zipper and more. Learn a new way to make a truly scrappy Half Square Triangle block using the according method developed by Beth Helfter of EvaPaige Quilt Designs. No two half square triangles are the same! Having an issue with a quilting project and need some help? Stop in to have all your quilting questions answered, or if you just need a little kick start to get you sewing again! Cost is $10, drop ins are welcome! Learn to applique garments using stencils and markings designed for Alabma Chanin style garments. Students will make an appliqued scarf to practice skills learned. 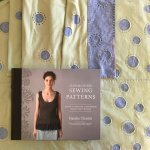 Make a hand sewn, A-Line Dress using the Alabama Chanin method. Made of cotton jersey, students have the option of embellishing the dress with applique/reverse applique, embroidery or permanent marker. Learn fit, construction, and embellishment. Students begin the project in class and complete it at home. Hand seaming optional. Learn to make this fun summer dress with pockets and secret buttons that adjust the length to a tunic! The Stella Hoodie is a feminine take on a classic hoodie sweatshirt. Stella is easy fitting without being baggy. The pattern, from the Tilly and the Buttons STRETCH! book offers dropped shoulders, a three piece drawstring hood and full length cuffed sleeves. You'll learn about sewing with sweatshirt fleece in this course and you'll have a chance to create a Stella hack in the second session. The Joni is a showstopper dress with a fitted bodice that features a stunning draped twist at the base of a deep V neckliine. The dress flares out into a flirty half-circle skirt that's great for twirling! Choose from three quarter or elbow length sleeves. The Joni can be made out of a rayon or cotton jersey for everyday or a stretch velvet, silk jersey or sequin jersey for a perfect party dress. The Joni is sized for busts 30" - 44". If your measurements fall outside of this range, please contact the job before registering. The Stella Joggers are the perfect joggers in sweatshirt fleece but they're also a great pant in a ponte for dressier casual wear. They feature a tapered slim fitting leg, slightly low rise with an elasticized waist and slash pockets. The base pattern comes with ankle cuffs but the pant can be lengthened and the cuff eliminated for a less casual look. The Stella Joggers are designed for hip sizes 33"-47". Please contact the shop if your size differs before registering for the course. Never made a quilt before? Come learn the basics! This is a quick and simple lesson on cutting fabrics straight and sewing seams. 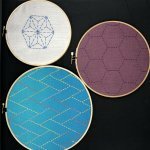 Sashiko is an ancient Japanese mending technique that creates beautiful designs using a running stitch. Bias binding gives the perfect professional finish to your quilt edges, and its actually pretty easy! In this class we will make continuous bias binding and then learn to apply it to the edges of a quilted piece to create a placemat. A new block each month designed by Cassandra Ireland Beaver. 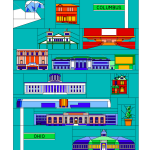 Each block will be a realistic take on a local landmark using paper piecing techniques. 13 months, May 2018 - May 2019. Join anytime. Foundation Paper Piecing "Boot Camp"
Foundation Paper Piecing (FPP) is one of the best ways to ensure perfect points, create complex piecing designs, and execute detailed pictorial designs. This class is perfect for beginner and intermediate levels. Take your curved seams to the extreme by going full circle! During this class you will create a top for a pillow or mini quilt using a Classic Curves Ruler with a twist! 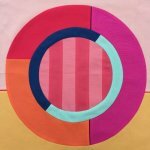 If you understand the basics of free motion quilting on your domestic machine, but want to expand your skills and add design motifs to your repertoire, this is the class for you! 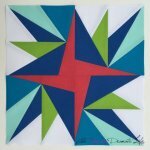 Create a matchstick quilted piece where matchstick quilting is the star! 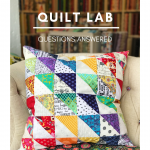 In this class you will use a pre-printed panel and 28wt Aurifil Thread to create a quilt that will work as a wall hanging or a pillow top. 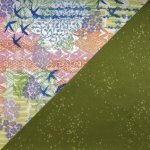 Series of 5 classes that teaches 4 skill building quilting techniques and how to put it all together. Take one class, or all five. Use both matching and contrasting thread to add energy and movement to this bubbly mini quilt! 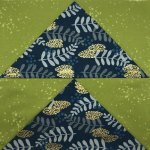 In this class you will design and quilt a mini using fusible appliqu? and free motion quilting. Learn to use your walking foot to create great quilt designs. Explore the use of scale by incorporating slashes into your design. 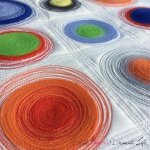 During this class you will create the top for a mug rug with semi-improvisational slashes that infuse 1/8? wide strips of fabric that add a dash of unexpected color or texture. Use a sewing machine and its hemming presser foot to complete a practice machine hem. 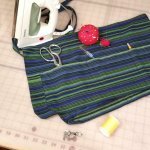 Make a small waist utility apron to practice skills. Machine Basics 1: Machine Use is required prerequisite or equivalent experience. Install Invisible/Concealed Zippers with confidence, step by step. Build your skills by sewing samples and making a small project. 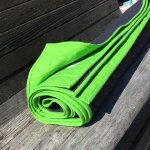 Sewing Summer Camp for Kids!!! All children, ages 8-12, will have a blast in this sewing morning camp! They will create three great summer projects; a pillowcase, a cinch sack back pack and a pair of shorts. Great for boys and girls! Price includes all materials and a snack.